How much pain can Red Line commuters endure? A packed shuttle bus left the Quincy Adams Red Line station for Quincy Center station in 2015. How badly do Red Line commuters want a faster, more pleasant ride to work, and how much pain are they willing to endure during construction? Over the next several months, rehab work or new construction will begin at every MBTA Red Line station in Quincy and Braintree, and it will overlap for months, even years. The T will begin construction at Wollaston, Quincy Center, Quincy Adams, and Braintree this summer or fall, and a private developer will begin work at the North Quincy station early next year. At some of the stations, construction will last upwards of three years. The MBTA hosted several public meetings to discuss its four projects, three of which involve parking garage repairs or demolition. The plans are largely set -- construction bid packages are due to go out by the end of April, according to the presentations by MBTA officials -- but most commuters were only hearing for the first time details that will impact their daily lives for years. The coming wave of construction has T riders bracing for more hassles in their commutes as they wonder whether the MBTA is overly ambitious. The manager of the Wollaston project responded that officials, including state Department of Transportation Secretary Stephanie Pollack, are aware of the volume of activity and recognize it’s a challenge. The Wollaston MBTA station in Quincy is slated to be rebuilt. The biggest impact will be for commuters at Wollaston, on Newport Avenue. Beginning this fall, the station will close for 20 months, a portion of the anticipated three-year construction period to make the station accessible to all riders, update its electrical and security systems, and correct a flooding problem, according to the MBTA’s presentation on the project, posted on its website. 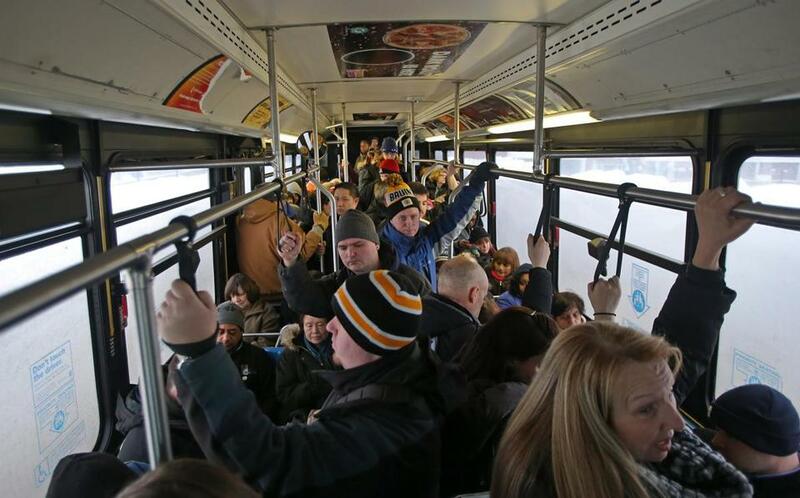 During that time, Wollaston commuters, numbering more than 4,600 every weekday, can take a bus from the station to North Quincy and board the Red Line there. But North Quincy is already busy, serving 7,000 commuters every weekday, according to ridership numbers compiled by the MBTA in 2014. The MBTA is hoping the “nightmare” envisioned by riders will be outweighed by the improvements its $38 million project will bring to handicapped-inaccessible Wollaston: three new elevators, two escalators, an updated lobby, and a station that doesn’t flood. The work in Quincy and Braintree is happening simultaneously because it is long overdue, both in making Wollaston accessible and in repairing the garages, MBTA spokesman Joe Pesaturo said in an e-mail. Further delay on the garage work could result in permanent closure, similar to what happened to the Quincy Center garage, Pesaturo said. “At the direction of the Control Board, the MBTA continues to develop an ambitious and aggressive schedule for making systemwide capital improvements that should have been made years ago,” he said. The construction comes at a time when Quincy is seeing much development around transit stations, making an already well-traveled system even busier. The Red Line is the busiest in the MBTA’s heavy rail system, according to “State of the Red Line,” a 2015 MBTA report. Ridership is growing, too, about 2 percent on weekdays and nearly 3 percent on weekends, according to the report. On the minds of many commuters was parking. Wollaston’s 538-space lot is full on a daily basis, and up to 115 spaces will be occupied by construction equipment, Cheever said. Drivers looking for spaces at North Quincy will see a parking crunch as well. At that station, Bozzuto Group and Atlantic Development are planning to begin construction next year on a $205 million mixed-use complex, including a new parking garage, housing, and retail space. Only about 350 parking spaces will remain open during construction, down from 852. Once the project is complete, about a year from when it begins in January, there will again be 852 spaces available to commuters, said Scott Bosworth, chief strategy officer at the Department of Transportation. The MBTA is exploring different options to mitigate the parking squeeze, such as using the Department of Conservation and Recreation parking lot in Squantum Point, or using North Quincy High School’s lot during the summer, Bosworth said. At Quincy Adams and Braintree, repairs totaling $73 million are being made to the garages, though only minimal parking spaces will be lost during construction, McCormack said. Quincy Adams will be under construction for three years and three months, and Braintree for 23 months. At Quincy Center, parking won’t be a new problem, because there hasn’t been any in the garage since 2012. A row of surface parking near the bus loop will be removed during construction, said McCormack. The MBTA will tear down most of the garage to make it attractive for redevelopment. The MBTA does not have plans to build another parking garage on the site, he said. McCormack said the demolition, a $25 million project, will last 18 months, beginning in July, and the station’s elevator will be unavailable for 20 weeks as it is replaced. Accessible shuttles will be available between Quincy Center and Quincy Adams for riders who need to use the elevator, he said.